Paint on a Bench (ベンチのペンキ, Benchi no Penki). 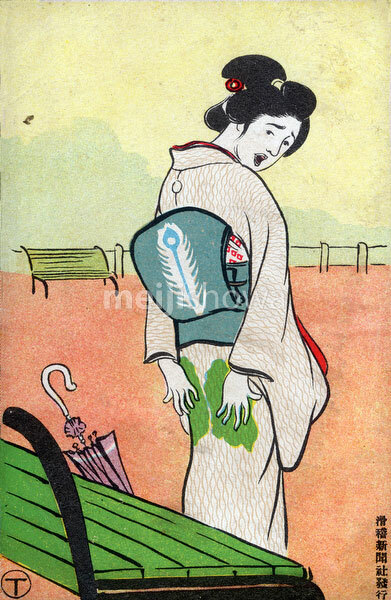 Postcard printed by the Kokkei Shimbun in 1907 (Meiji 40). The satirical publication was founded in 1907 by Osaka-based journalist Miyatake Gaikotsu (宮武外骨, 1867-1955). It featured a supplement named Ehagaki Sekai (The World of Illustrated Postcards) containing 30 postcards.